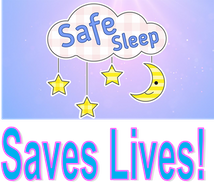 The SWLA Safe Sleep Task Force works to educate parents, professionals and caregivers on the American Academy of Pediatrics Safe Sleep Guidelines and to improve knowledge, attitudes and beliefs about the risk of unsafe sleep environments. We are passionate about infant safety and health and are committed about spreading our message. The Task Force, through Community Partnerships, provide educational classes and materials to new and expecting parents and caregivers, as well as Continuing Education credits for professionals. The Task Force participates in health fairs and other community events to spread the safe sleep message to the community. The Task Force partners with the Calcasieu Parish Coroner’s Office and Community Chest, Inc. to promote their Cribs for Kids® Program, which provides portable Pack and Play cribs for families who can not afford a safe sleep environment for their infant. Help us save babies! Donate today! Cribs for Kids® is a national program that helps educate families, caregivers, and professionals on the dangers of unsafe sleep environments and helps organizations provide portable cribs for families who cannot afford a safe place for their infant to sleep.